Originally from Lisbon, Madalena Alberto moved to London to study performing arts and since graduating has developed a successful career in musical theatre. 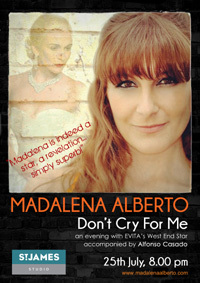 She has recently played Eva Peron in Evita both in the West End and on tour, as well as playing Fantine in Les Misérables in the 25th anniversary international tour production and the title role in Leicester Curve’s production of Piaf. 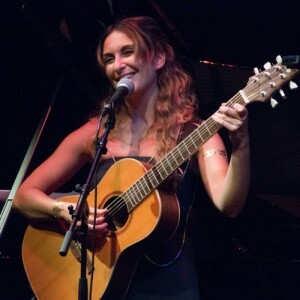 Alongside her work as an actress, she has also developed a further career as a singer/songwriter. Performing her first solo show in London at St James Studio, Alberto opened with a great attention-grabbing start, an unaccompanied rendition of Blues in the Night, drawing us in with an unexpectedly breathy soul sound, morphing into a somewhat cynical and intriguing Girls of Summer. She went on to point out she has played many dying prostitutes, and while not so comfortable with the prostitution bit, she is “good at dying”. Singing the touching Someone Like You from the musical Jekyll and Hyde she also appeared in at the Union Theatre, playing a prostitute, she demonstrated the vulnerability of the character and flexibility of her voice. Pleasingly, Alberto also reached out to us when singing, maintaining eye contact and engaging us in the story, rather than retreating to the character – a fault common among several musical theatre singers when performing cabaret. Various guest artists were invited to take part including musical singers Sophie Evans, Ceili O’Connor and Simon Bailey, actress Jade Anouka giving an effective translation of the poetry of Alberto’s Portuguese song, and musical theatre writer and singer Sam Cassidy duetting from his piece 27 The Musical. The show was also live-streamed internationally, adding an extra layer of interest with comments coming through from Spain, Los Angeles and indeed, Sunderland. While the first half of the show concentrated principally on songs marking Alberta’s career as an actress, the second half had a very different feel, showcasing her folk compositions. Joined by a saxophonist, piano accordionist and percussionist, and accompanying herself on guitar under the musical direction of pianist Alfonso Casado, to my mind most of the standout numbers occurred here, not least because so many were unusual and written by Alberto herself. The material has a distinctively European gypsy-esque quality to it, with a variety of languages, rhythmic patterns and moods. I particularly liked Gypsy’s Lament about a girl choosing freedom in the woods over conventional life; Heart Condition, focusing on the complexities of love; and my personal favourite, Hispanic Feeling, on the subject of jealousy. This was a well-constructed evening, encompassing the wide range of Alberto’s tastes and talents, with an emotional arc to the show gradually reaching ever higher, until the very end with the encore song for which she might be best known, Don’t Cry For Me Argentina, which she sang with a refreshing simplicity. This was an excellent London solo debut. Alberto is about to open in August in a play at the Cockpit Theatre, Human Interest, but has decided to take a year out to explore further artistic opportunities and consider her future direction. Hopefully, she will not leave it too long before creating another concert. This entry was posted in Cabaret Reviews and tagged Alfonso Casado, Madalena Alberto. Bookmark the permalink.